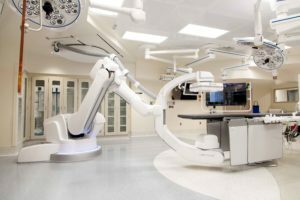 Healthcare facilities around the country are looking to modernize and improve the patient experience while also optimizing operations and improving efficiency. Whether building new facilities or renovating and expanding existing ones, healthcare construction requires a unique approach to deliver projects that prioritize patient care. With experience delivering medical facilities ranging from surgery suites to trauma centers to entire medical center campuses, Hensel Phelps builds for some of the largest healthcare organizations in the country. Our integrated approach to construction brings teams together to focus on patient comfort, while also incorporating critical elements unique to healthcare, such as infection control, into our project plans. In Colorado Springs, Hensel Phelps is working with multiple healthcare providers to renovate and expand their facilities. Projects at UCHealth Memorial Hospital Central, Memorial Hospital North, and Grandview Hospital include an interventional radiology suite, imaging suites, a Hybrid OR and PACU space, a central sterile suite, an outpatient clinic floor, and the addition of new emergency departments across several campuses. On the Lucile Packard Children’s Hospital campus at Stanford, Hensel Phelps is partnering with facilities and hospital staff to build out the 5th floor while the hospital remains fully operational. When complete, the 5th floor will consist of two new bed wings, one for stem cell patients and one for oncology patients, totaling 49 patient beds, in addition to a pharmacy and support spaces. For the first time in over 40-years, San Diego’s South Bay community is getting a much-needed medical hospital addition. Sharp Healthcare tapped the Hensel Phelps team to construct the $190 million, 197,696 square-foot, seven-story Ocean View Tower. Connected to the existing hospital on the medical campus, the new tower features a large, light-filled lobby, 106 spacious and private patient rooms, operating rooms, Intensive Care Units (ICU) suites, medical-surgical patient rooms, central nurse stations, family waiting areas, a rooftop café, and indoor/outdoor dining with panoramic ocean views. With more exciting healthcare projects on the horizon, Hensel Phelps continues to train our field teams in the latest standards and with increasingly advanced technology. Whether it’s virtual reality for digital mock-ups of patient rooms and surgery suites, or the use of software such as Plangrid to enhance quality management, Hensel Phelps is looking toward the future of healthcare construction.